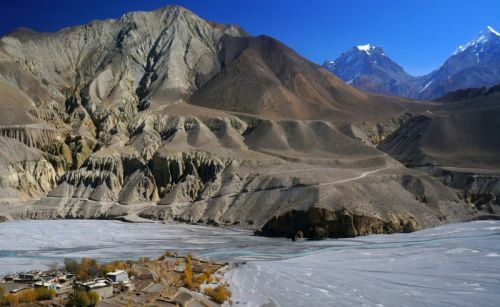 The “Forbidden Kingdom of Mustang” lies on the northwest of Nepal, bordering on three sides with Tibet. It lies north of the main Himalayan range in the area known as the trans-Himalaya. 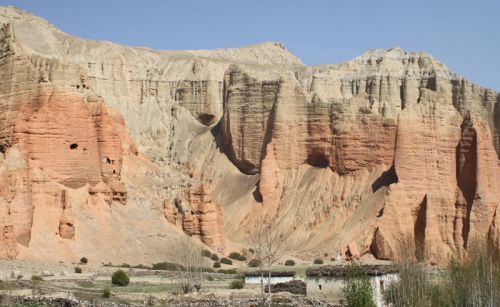 The Tibetan influenced area north of Kagbeni is known as Upper Mustang. It was only opened to trekkers in March 1992. With its rich culture and magnificent mountain views the Kingdom of Mustang is one of the most outstanding areas of the Himalayas. The former Himalayan Kingdom is an arid and starkly beautiful land. A vast high valley, arid and dry, it has a barren desert-like appearance similar to the Tibetan Plateau and is characterized by eroded canyons and colorful stratified rock formations. Mustang was once an important route for crossing the Himalaya between Tibet and Nepal, and many of the old salt caravans passed through Mustang. It is this area which we will trek to, discovering the wonders of the architecture, language, culture and tradition which are almost purely Tibetan in this once-upon-a-time mystical kingdom. We get to enjoy the rich culture of the Bhotias and the Lobas in their traditional form, unchanged with time and modernization. This trek takes you to the once hidden kingdom of Lo and offers you a once in a lifetime opportunity to witness the ancient villages, palaces, forts and monasteries. Once you reach the walled village of Lo Manthang, the capital of Upper Mustang, you get to explore the walled village and its ancient monasteries. There are more wonders to explore around Lo-manthang including monasteries hung on the cliffs, the man-made dug-in-tunnel caves on the cliffs where people used to live and colorful villages of Tibetan influence. Lo Manthang is also home to Mustangs former King Jigme Palbar Bista who lost his royal title in 2008 after Nepal became a republic. But he is still highly regarded and respected by the locals. He and his family still occupy the four storied royal palace situated at the center of the city square. We can have an audience with the King and Queen on request.